The Witching Hour: Sweep/Wicca series: soon to be a film? Sweep/Wicca series: soon to be a film? I'll admit, I knew next to nothing about this series of books aimed at young adult readers. It's called Sweep in the U.S. (where the stories tale place), but is called Wicca in the Uk, Netherlands, Australia and Belgium, and White Magic in France and Italy. In Scandinavia, it's not called anything at all, because its publication there was cancelled due to worries over the "religious" content. 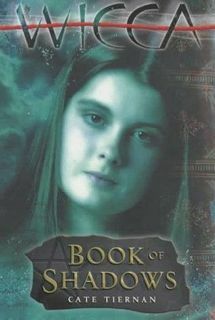 The story centers around a "blood witch" named Morgan Rowlands who becomes involved in Wicca when a handsome new male student named Cal comes to her school. After discovering she has a "knack" for Wicca, she learns who is a witch by blood (whatever that means) and, over the next fourteen volumes, various exciting events occur. The characters have names like "Sky Eventide" and "Killian MacEwan" and "Selene Belltower." 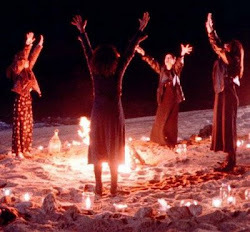 There's an International Council of Witches. I'm not sure how supernatural the proceedings are, but I have a feeling the film version will have special effects a-plenty. An introduction to the series through the eyes of three main characters appears on the author's blog. It does seem to have the kinds of ingredients young adult readers are going for these days: romance, intrigue, oh-so-wrong liaisons, and teenagers with mysterious powers. And here the author relays the news that the series is being developed for a feature film. The Variety article says Universal is producing. So, is this series another Harry Potter or Twilight phenomenon? Hardly. This blog describes the Tiernan's process for writing the series, and it turns out she was approached by an editor to do it, rather than coming up with the idea herself. It more or less sounds like these books were written by committee. As the Fire Fairy blog states: "...17th Street came up with the concept, sold it to Penguin, and then found Tiernan. Each of the books in the fourteen-book series was developed from an outline, which all three signed off on. Tiernan then went ahead with a first draft, which in turns was edited by both the packagers and publishers and returned to the author for revisions. This rewriting sometimes went through four drafts or more until all concerned were satisfied with the result." So, I'd be interested in hearing from any of you who have read these books. Do you think they'll make a good film? "Sky Eventide"? Doesn't she post over on PaganSpace.net along with Mars Sparkles and Rbel the Dark Poet? When my tired eyes read the headline though, I saw "Streep/Wicca," and I thought that Meryl Streep was appearing in a Wicca-themed movie. Now that might be interesting. Would she be the all-wise HPS who bursts into long as in Mama Mia? Oh I'd love to see Meryl in a film dealing with witchcraft on any level! Does She-Devil count? I've read the series 3 times, and wondered if they could make it into a film... I think it would be nice. However, the series has 15 books, some of the good stuff has to go if they want to fit it into one film. I would really love to see this series become a movie. I have read all the books so many times. I love them. I feel kind of connected to them if that doesn't sound weird. Witch Hunting? There's an App for That. The Rite: Exorcism becoming a trendy new topic? See Movies with Friends! Witchy Friends!